Morning, starting sometime in early June the blog is going through a bit of a makeover. More posts, more content, a bit more yabbering about cool sources that kind of thing. One of the sections I am pretty passionate about is one I’m entitling more bang for your buck – or decorating on a shoestring. Some people are a little snooty when it comes to DIY (me included if it looks like a craft project). If however ifÂ it looks like you’ve just purchased something that has cost a zillion bucks but infact has cost you very little then I’m on board big time! That is the great thing about style it has got nothing to do with money. Money helps obviously, as my business has grown I’ve brought the odd high enderÂ but in order to create an interesting dialogue I’ve coupled them with pieces that have cost next to nothing or pieces that I’ve revamped, tweaked ‘made over’ if I dare use that phrase. So whether you have the cash to splashÂ orÂ whether budgetsÂ are tight DIY should be something that from time to time we all embrace. Oh and just to warn it gets a little addictive. A – pattern. 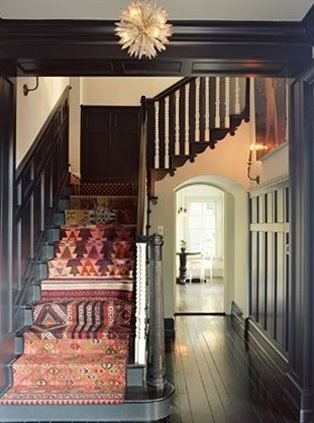 Whatever rug you choose no matter how small or large, try if you can to have some element of pattern in it. Pattern as I say a zillion times is like an herb it brings a space alive, no pattern no intrigue. B – colour palette reigned in. I say this a zillion times also but if you restrict yourÂ colour palette you can actually mix way more patterns than you think possible. Large motifs with small motifs, stripes with geometrics it all comes to a restricted colour palette. Forget what youâve learnt at design school or read about in books â you can totally put any pattern with any other pattern as long as there are only a few colours going on â otherwise as the Americans say it will look like a hot mess! The second image to inspire is this one. Art isn’t easy to find at the best of times but if you can pull something off like this then wham bam gold star toÂ you. Couple of pointers go supersized if you can, not only will it elevate your space it will feel immediately grander and edgier than it really is. Any kind of font on a large canvas or board constructed from MDF or ply looks super cool in any space. Bedrooms, hallways, living rooms you name it. Both these projects are lazy Sunday afternoon kind of tasks – I for one don’t have the patience for things to take a age. Want it done now this minute so I can get onto the fun stuff – styling it up! Not quite sure what that says about my personality but lets leave that to the therapist shall we!